Although there were a number of great tennis matches yesterday at the central coast tennis open at the Templeton Tennis Ranch. Scott Clear says they also had some fun for the kids. They called it Kid’s Play. 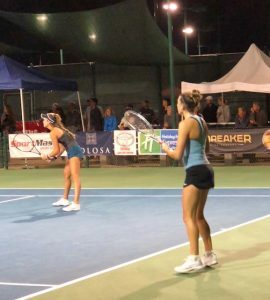 Last night in doubles play, two teams with an Arroyo Grande connection faced off. Sophia Whittle is a senior at Arroyo Grande. She and partner Donique Schafer played Christin Maddox and Delanie Dunkle. Dunkle graduated from Arroyo Grande and is now playing for Gonzaga. Whittle has committed to play at Cal Poly next year.